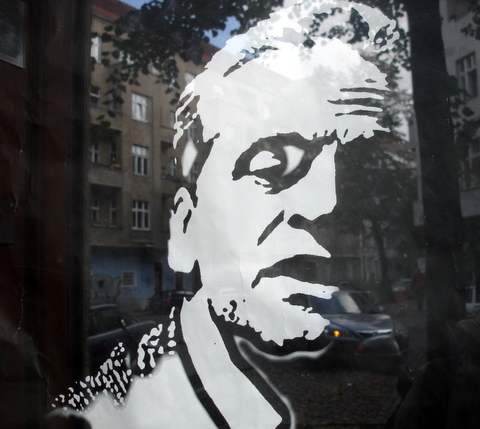 I feel a bit embarrassed about how seldom I am in Kreuzberg, and suspect that writing about the fabulous pastry shop on Oranienstraße will make some wince the way I wince when people exclaim that there's this really great bar called the Wohnzimmer in Prenzl'berg. Oh, but those lovely shiny heavy trays inscribed with their weights, which look as if they'd kill a man if brought down once, sharply! And those perfect golden rectangles of baklava! What a relief, after too many doses of sickly glucose syrup plus faintly rancid nuts, to have pastry just sweet enough, just crisp enough, just faintly perfumed enough -- and with a ground-nut layer both meaty and clean-tasting. Incidentally, a visit to Melek Pastanesi is the perfect finish to a movable feast that begins down the road in Cafe Bellona; their freshly made gözleme are just the subtle treat you would hope for. Next time I'm determined to follow Yvonne and try the mysterious garlicy sausage variant. Meanwhile, while I've been away, Bowleserised and Bleistift und Notiz have sent my stats soaring in recent days, so many thanks to both lovely ladies. The latter snapped up the second berth in the grand pay it forward caravan. Really, does no-one want the third? I was too busy having fun to take a single decent photo of the evening, but that can't stop me from writing about the joy that was the first Grub Berlin. I was thrilled when Rebecca shared her idea of duplicating the monthly food event her sister organizes in Berkeley -- an all-comers potluck sounded like just my thing -- and last night exceeded all my expectations, with a wonderful multilingual crowd and two groaning tables laden with so many autumnal treats that I can't even begin to itemize them. For those whose pulse quickens at the thought of such an event, do email me for details of the next one (tentatively slated for January). And here is Rebecca's explanation of Grub: "Grub is a gathering of diverse people coming together for a delicious meal, good company, and good conversation; sort of a modern potluck in which everyone will cook something to share. Grub is also a way to practice the ways in which buying and cooking with food that is grown locally, organically, and sustainably both tastes good and can improve our community and the world. This isn't always possible, but it’s a nice goal!" I think so too. 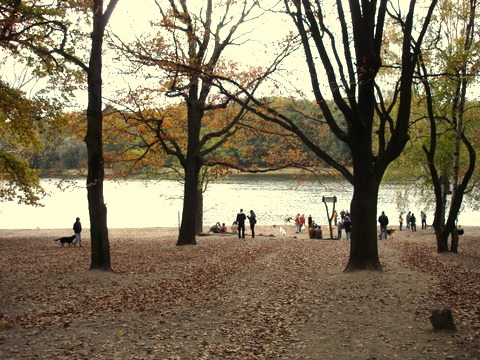 At this time of year, there is no better place to enjoy autumn's elegaic atmosphere than the Grunewald. 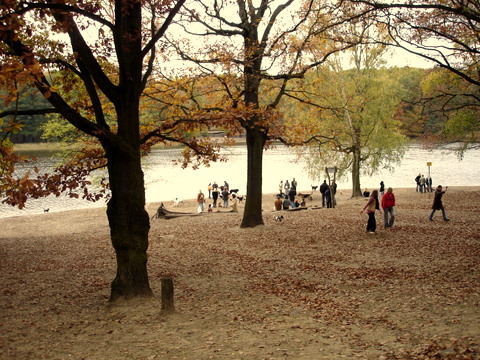 Around the lake, people appear newly bulky in their winter coats, while dogs frolic wildly along the water in packs of five. After a turn around the lake, you're hungry, and there's the somewhat grand, somewhat kitschy Forsthaus Paulsborn just waiting for you with its array of cakes and fall specials. As you walk back to the bus stop, a few leaves falls from an oak.